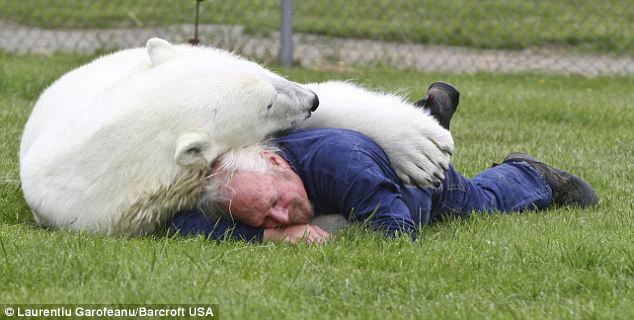 Grizzly man Mark Abbot Dumas is the only man in the world who can touch a polar bear. 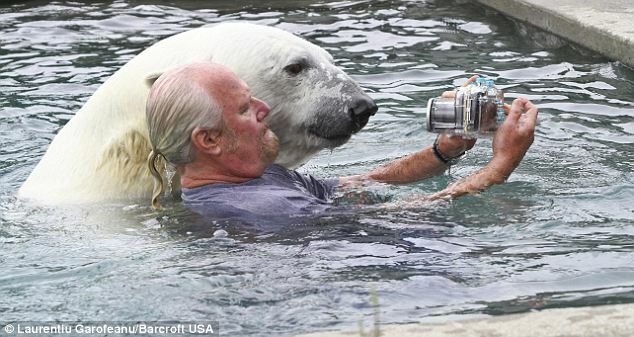 The fearless animal trainer even goes for dip in a swimming pool where he and 16-year-old polar bear Agee enjoy a watery cuddle together. 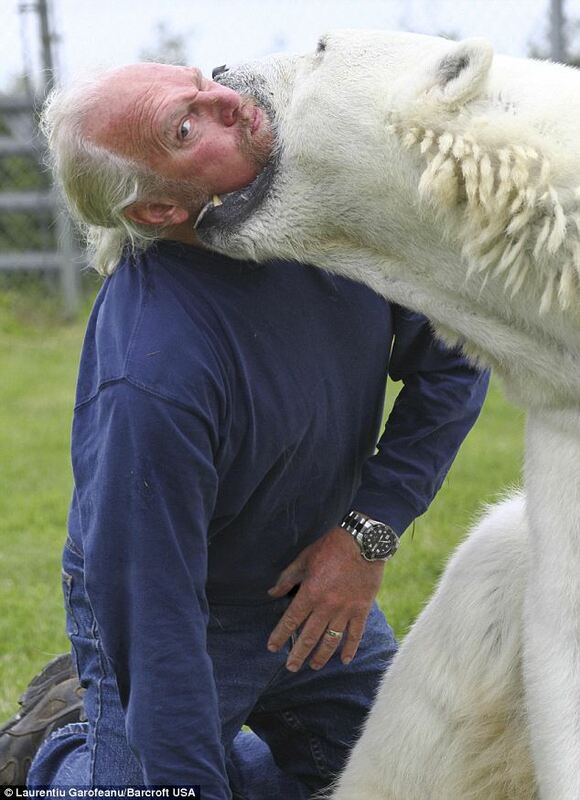 Back on dry land he wrestles with the 60-stone (800lb) beast in her enclosure and bravely lets Agee clamp her huge jaws around his head. And when the wrestling has tired both the animal expert and huge Agee out, they both enjoy a nap together inside Agee's enclosure. 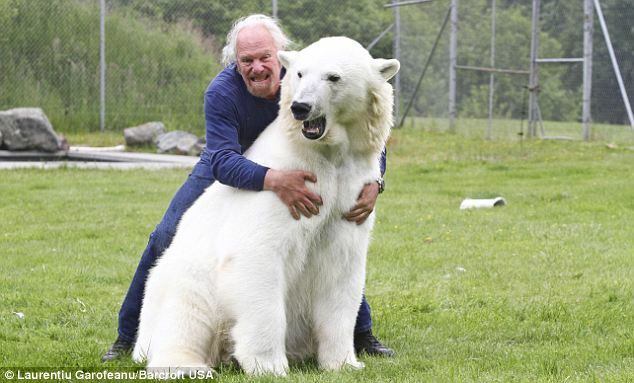 Mark, 60, and wife Dawn, 49, from Abbotsford, British Columbia (BC), Canada, train the polar bear - the world's largest land predator - to star in high-budget TV adverts. She even appeared in movies like Alaska in 1995 when she was just a few weeks old. With their incredibly intimate bond Agee even bear hugs owner Mark as she rears up on her hind legs to over seven feet. ‘If anyone else tried this they would end up as Agee's dinner,’ said Mark. ‘The only people in the whole world she likes are me and my wife. ‘I have worked with bears in this way for over 40 years, so I can read Agee's body language and know how to behave safely around her. Mark and Dawn took Agee on when she was just eight weeks old. With links to Hollywood through previous work with animals, Mark was approached by director Fraser Heston - the son of screen legend Charlton - 16 years ago. 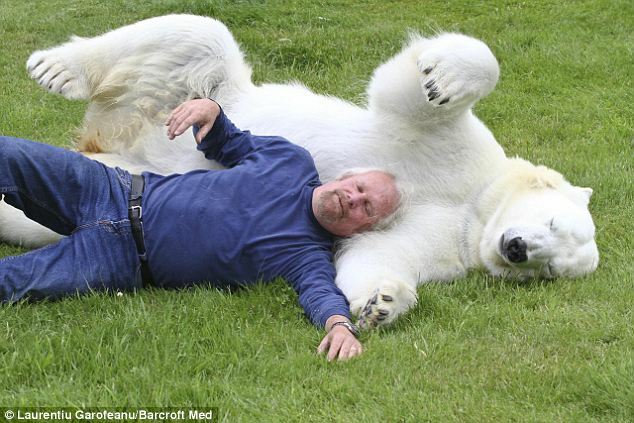 Heston needed a polar bear cub for his forthcoming film Alaska and Mark found Agee - a surplus cub at Kolmarden Zoo, Sweden. Mark and Dawn went through a lengthy application to show they had the facilities to care for her. After being approved they transported the tiny cub - seen here at their old family home in Mission, BC, just after her arrival - to Canada. ‘She lived inside our home for the first few weeks and we hand-reared her,’ said Mark. Now Agee spends her time living in her new enclosure on rented land near Mark and Dawn's home in Abbotsford, and on the road working on TV and film sets. At home, Mark enjoys 'play time' with her. ‘Earlier in the morning she's more playful and relaxed and she lets me roll around with her. ‘We wrestle for fun and sometimes we fall asleep on her grassy lawn together. It's a great way to unwind after a bad day. Later in the day - when they are preparing for filming - Mark 'works' her, training Agee for the requested script requirements. Agee performs a variety of commands in exchange for her favourite treats - steak, cookies, salmon and chocolates. On cue from Mark, she rears up on her hind legs and will even pretend she's roaring when instructed to 'smile'. Agee will also lie down, crawl and sit up in returnfor reward foods. ‘She loves her work,’ said Mark. ‘They are extremely intelligent animals and you can see she gets enjoyment out of being stimulated through her work. ‘She could never have lived wild so it's important to us that we keep her active and thinking. In the evenings Agee is fed on mountains of protein-rich salmon, chicken or other meats, along with carbohydrates she gets from high-quality dog food and vitamin supplements. ‘In the wild she would be eating seal but we can't buy that so we have to try and replicate a fat-rich diet,’ said Mark. ‘Because they scavenge in the summer - when they are off the sea ice and on dry land - they have very adaptable diets. Amazingly, Agee seems to have favourites between men and women. ‘She gets very jealous of other women talking to Mark,’ said Dawn.